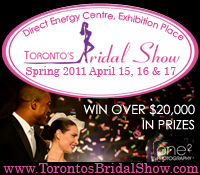 Attention Brides accross Ontario – Don’t miss the Toronto’s Bridal Show taking place April 15 – 17, 2011 at the Direct Energy Centre (100 Princes’ Boulevard, Toronto, ON)! Stop by the Her Wedding Planner booth for exciting contests. For the romantic, the sound of wedding bells marks the beginning of years of marital bliss. For the realist, those chimes signify the culmination of a year of hectic haggling, careful planning, and perpetual fittings. If you’re getting hitched, you can ensure your wedding goes off without a hitch with the support of Toronto’s Bridal Show at the Direct Energy Centre, April 15, 16 & 17, 2011. Toronto’s Bridal Show, where the best in the marital union business gather bi-annually to show off their goods, and offer discounted rates and special promotions that’ll save you precious dollars on your big day. Showcasing over 150 bridal industry specialists, it’s the perfect place to find whatever you need for a majestic wedding and life after “I do”. Whether you need dresses for the bridesmaids, a venue for your reception, or that elusive perfect wedding gown, you’re search will end at Toronto’s Bridal Show. With inspiring fashion shows, and $20 000 in prizes to be won, this is one show brides and grooms to be can’t afford to miss. Toronto’s Bridal Show is put on by Long Valley Productions, producers of the hit TV reality contest to Last Bride Standing. This uber intense standoff has future brides facing off against one another for a wedding package worth over $100 000. The woman with enough physical and mental stamina to be the last one standing with their hand on the wall is the winner. By the way, this can take up to 5 days. Check out the website to find out more about this exciting bridal convention, scheduling and this year’s taping of Last Bride Standing. For more information visit the www.torontosbridalshow.com.